Developed with assistance from Fowler Laundry Equipment Co., Union, N.J., the laundry features a robust lineup of nearly 50 ExpressWash Washers, several 75-pound-capacity Continental PowerLoads Washers; and 50 ExpressDry Dryers. 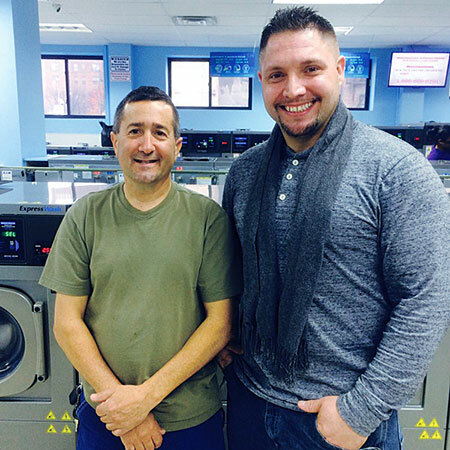 Co-owners Robert Danza (left) and Scott Sartory created the laundry for convenience and efficiency. Editor's Note: A number of vended laundry projects are completed around the country each year, resulting in brand-new or rejuvenated stores primed and ready to serve customers. As a way to celebrate the hard work that goes into designing, building and equipping a modern vended laundry, American Coin-Op created this Portraits of Success feature to spotlight memorable projects of recent vintage. 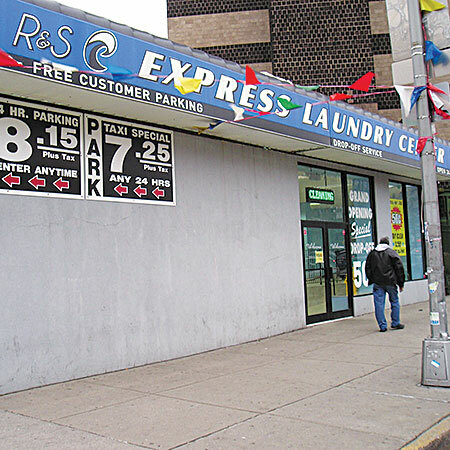 BRONX, N.Y. — The customer- and Earth-friendly R&S Express Laundry Center (R&S) here transforms laundry day into laundry hour, according to co-owner Robert Danza. The 6,000-square-foot megastore is equipped to nurture customer loyalty, simplify management and stunt utility costs. It’s lined with high-speed Continental ExpressWash® and ExpressDry® laundry equipment and features an ESD Synergy Wireless Card System. Simultaneously, Danza cuts utility costs and promotes customer loyalty and turnover. The washers are engineered to reach extract speeds of up to 400 G-force, according to Danza. In doing so, they remove more water from laundry loads and shorten resulting dryer time by up to 50%. Customers wash, dry and fold laundry in less than an hour, which is the central theme of Danza’s advertising efforts. The laundry serves more customers per day thanks to shorter dry times, and the dryers run less often, which reduces wear and tear and cuts natural gas and electrical usage. “Laundry dries in 20 minutes instead of 45 minutes,” says Danza. The laundry is one of the first in the country to use the wireless Synergy System. It features wireless card slide readers (mounted to washers and dryers), an on-site server, and Value Transfer Machines (VTM). Customers use loyalty cards to operate equipment, and Danza gains remote access to MyLaundryLink—a cloud-based reporting suite accessible via the Internet—to facilitate store management. Synergy is configurable to accept loyalty cards alone or loyalty cards and quarters. At R&S, only loyalty cards are accepted at washers, dryers, vending machines and registers. Customers access VTMs to load value onto their cards. 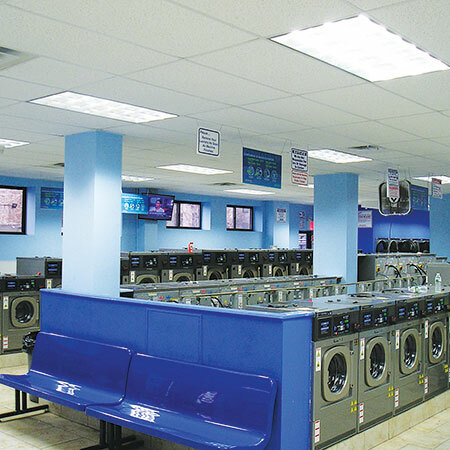 Through MyLaundryLink, Danza controls washers and dryers; programs time-of-day pricing and in-store specials/promotions; tracks employee hours; monitors turns per day, revenue and wash/dry/fold activity; reissues lost customer loyalty cards; and tracks and verifies customer card usage and balances. MyLaundryLink also assists with payroll by tracking employee hours and pay rates. Moreover, Danza schedules promotions through Synergy, replaces or revalues loyalty cards, and views customer transactional histories. All this can be accomplished remotely from his smartphone or computer. In the same manner, Danza monitors the wash/dry/fold operation that makes up 25% of R&S’ business. Attendants, who provide personal service 24 hours a day, assist customers and handle full-service wash/dry/fold and drop-off dry cleaning. Open daily, R&S draws customers looking for “faster, cleaner, better.” It touts personal customer care, a spacious children’s play area, full-service wash/dry/fold, card operation, flatscreen TVs, and snack and detergent vending machines.